Our local chapter of Habitat for Humanity is currently building the 18th house in the community. The Macleod family will be the recipient of this home. 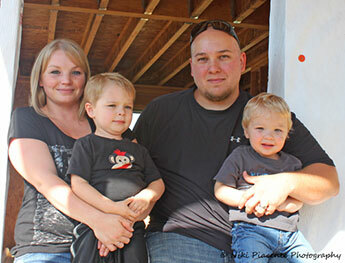 Ben and Kali have been married five years and have two children, Bryce and Gavin. Bryce was diagnosed with aortic stenosis, a heart condition that affects the main valve in the heart. Between the high rent necessary to have a house large enough to raise two children and the medical bills associated with Bryce’s condition, Ben and Kali decided to apply for a Habitat house. After 6 months in the application process and meeting with the board, they were approved. Each family must contribute at least 500 “sweat equity” hours into the building of their new home, and at a recent count, Ben and Kali were at 319. We are looking forward to welcoming the Macleod family into their new home upon its completion in early 2013.